“Summer Nights” will give area residents a reason to celebrate in June and July 2018 with four free concerts in Downtown Dayton. On June 23, June 30, July 7 and July 14 free concerts featuring a variety of musical styles will be presented on the Rhea County Courthouse stage or at Centennial Park across the street from the courthouse. The idea for a summer activity in Downtown Dayton has been discussed for several years between members of MainStreet Dayton, the Dayton Chamber of Commerce, downtown merchants and other interested individuals. “With the new stage at the courthouse and the wonderful facilities at Centennial Park, this seemed the right time to start what we hope will become a continuing summer event,” Mr. Davis said. In addition to the music, food, refreshment and other vendors will be invited to set up each night. 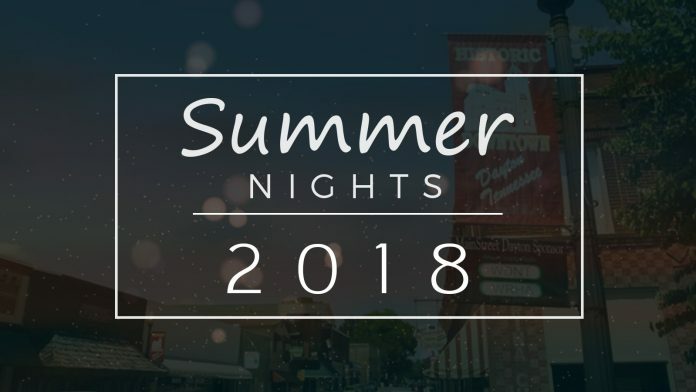 Summer Nights is organized by the Scopes Festival, with support from Keener Marketing, County Executive George Thacker and Dayton’s Strong Women. For more information including vendor applications and a detailed schedule as it comes available, check the Scopes Festival website, www.scopesfestival.com or the Scopes Bluegrass Competition website, www.scopesbluegrass.com.